JACCC is proud to serve as an unique rental facility in the heart of Downtown Los Angeles. This page lists just some of the special events produced renters at JACCC. It is the Taisho Period in Japan. Tanjiro, a kindhearted boy who sells charcoal for a living,finds his family slaughtered by a demon. To make matters worse, his younger sister Nezuko, the sole survivor, has been transformed into a demon herself. Though devastated by this grim reality, Tanjiro resolves to become a “demon slayer” so that he can turn his sister back into a human, and kill the demon that massacred his family. A sorrowful-tale of siblings in which the fates of humans and demons intertwine…begins now! Join us for the Special Premiere of DEMON SLAYER: KIMETSU NO YAIBA! What if? ... What if a brash American naval officer and a young Japanese girl met and fell in love? How would they communicate? (Certainly not an Italian!) In POP's most ambitious production to date, Artistic Director Josh Shaw's long-time dream of a bilingual interpretation of Puccini's Madama Butterfly comes to life at the Aratani Theatre in Little Tokyo. All Japanese roles will be sung in Japanese (by Japanese American artists), and all American roles will be sung in English. Subtitles in both languages will be projected throughout the performance. This is a co-production with Opera in the Heights (Houston) and will be presented fully staged and costumed, with orchestra and chorus. For more information about Madama Butterfly, click here. ArtChangeUS REMAP: LA Cultural Equity Summit will gather cultural leaders, artists, grantmakers, and community members to advance cultural equity strategies and innovative practices at the Aratani Theatre on Wednesday, April 17, 2019. The United States is being remapped by its people. By 2042, the population of US communities of color will eclipse the historic white majority. While the population has shifted on the ground, institutional leadership and funding across the arts and all sectors have not kept pace. Leading the nation, Los Angeles and New York City have implemented major studies of diversity, equity, and inclusion in their cultural communities. The Summit asks: What role do we each play in moving towards a shared future? Join a public sector discussion led by heads of city arts agencies moving research into action from Los Angeles, New York, Oakland, San Francisco, and Seattle. lolaland: the grandmother of all shows! This much-anticipated team up of Filipina-American artists make its way to Los Angeles! Starring singer-comedienne Fe De Los Reyes, “LolaLand” was sold out in Manila (Philippines), and soon restaged in New York and the Bay Area. Special guest performers include songwriter Cecile Azarcon, singers Jam Morales and Chiqui Pineda, and singer-songwriter Odette Quesada. JAPAN HOUSE Los Angeles is excited to partner with premier music and arts universities Tokyo University of the Arts (Tokyo Geidai) and the University of Southern California (USC), in presenting “Vivaldi ‘The Four Seasons’ Live Animation Concert,’” bringing together emerging talent in the fields of music and animation from both Japan and the United States. Students and faculty from the music departments of Tokyo Geidai and USC, two of the most prestigious music programs in the world, will perform a free musical program of “The Four Seasons” by Vivaldi at the Aratani Theatre. This event will feature a true visual euphony performance of Vivaldi’s “The Four Seasons.’” Using Yamaha “score following” technology, an AI program that listens and continually synchronizes the animation with music, each season will be accompanied by animated films by renowned independent animators. This is the North American premiere of this exciting multimedia collaboration between two of the finest music and arts universities in the world. Event Hosted by: Tokyo University of the Arts (Tokyo Geidai), University of Southern California, and JAPAN HOUSE Los Angeles; Supported by: Japanese American Cultural and Community Center (JACCC); Technical Support by: Center of Innovation Tokyo University of the Arts (Tokyo Geidai); Sponsored by: All Nippon Airways Co., Ltd.
All-4-One, The Jets, Surface, together with Ryan Gallagher, Geneva Cruz, Thor, Vingo “April Boy” Regino, and Airspoken. Realization of Dreams Foundation, a non-profit organization, invites you to our first annual “Give Love on Christmas” charity concert to raise funds for College Scholarships for less privileged and high achieving students. 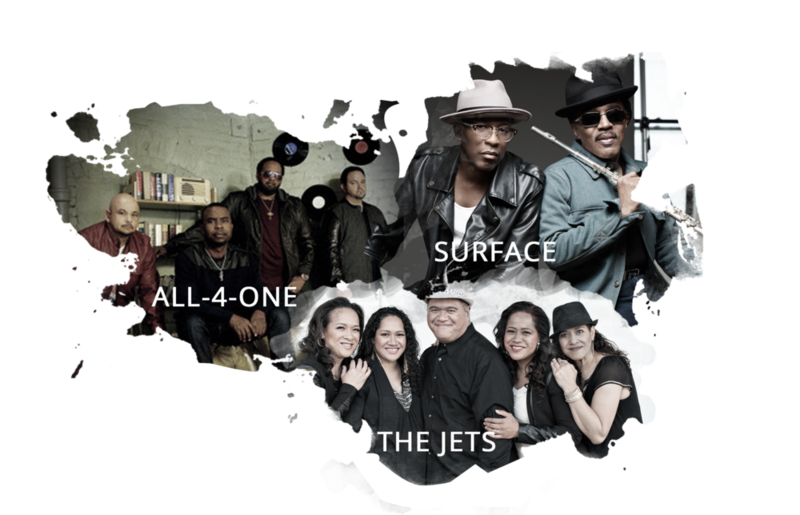 For the first time, three of the biggest hit makers in the 80’s and 90’s - All-4-One, The Jets and Surface will perform together on one stage at this charity concert.These groups were best known for their hits "I Swear", ”I Can Love You Like That”, “You Got It All”, “Crush on You”, “The First Time”, "Shower Me with Your Love" and many more. However, the night does not stop there. We will also be graced with the talents of Ryan Gallagher, Airspoken, Geneva Cruz, Thor, and April Boys Vingo Regino. A performance that allows young Japanese-American and Japanese artists of California to collaborate and showcase their talents. Founded by the first non-Japanese kabuki actor, Nakamura Gankyō, “Shinsei Kai” will bring together various emerging artists from various art forms, featuring taiko artist Walter Nishinaka, calligrapher Kunihara Yoshida, and koto musician Brian Mitsuhiro Wong. The concept behind “Shinsei Kai” is to allow young artists an opportunity to expand their artistic boundaries and have master artists give their support and guidance. Joining us from Japan is master artist Bandō Ai (Japanese classical dance), and from the San Francisco Bay area, koto master Shirely Muramoto Wong. In addition, “Shinsei Kai” will feature the presentation of official name taking, or natori hiro, of Los Angeles local Bandō Kyōharumi (AKA Cheryl Ikegami). This is the first presentation of official name taking presented by local Japanese dance artist, Bandō Hirohichirō. The official name can only be granted by the headmaster of the Bandō school, then Bandō Mitsugorō X, and only after the dancer has undergone vigorous training of the mind, body and soul. For more information or inquiries, please contact Carol Onaga at (213) 628-2725 or onaga@jaccc.org.